Celebrate the little piece of the world where you shared a special date with this commemorative puzzle. Of the 192 countries, millions of cities, and more than seven billion people on the planet, somehow you found each other. Celebrate a date and place close to your hearts with this commemorative jigsaw puzzle. 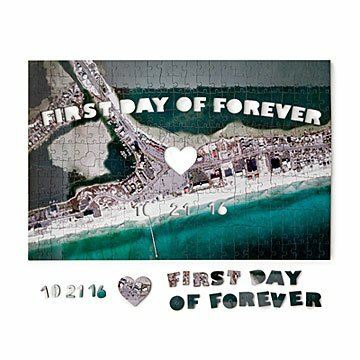 Your one-of-a-kind puzzle displays an aerial map of your unique location and includes pieces that spell out "first day of forever" and your chosen date. There's even a heart-shaped piece, making it an extra-special way to remember the day you met, went on your first date, got engaged, or tied the knot. Each piece is made of thick, quality-crafted wood, so this keepsake is in it for the long haul. Just like the happy couple. Made in England.